I would also like to take this time to pay it forward, therefore I ask that anyone who is interested in receiving encouraging snail mail to email me at 10hopeingod@gmail.com. I promise to not egg your house, peep in your windows, tp your trees, or sell your address. I just want to send you cards and little gifts of encouragement. Why? It’s simple. I absolutely love to bless others who are in the same boat and rowing on the same rough waters of infertility as me. This struggle can be lonely, heartbreaking, and discouraging and I never want anyone to feel this way. So please let me add you to my list of other ladies I already pray over and send encouraging cards too. It would be my honor and privilege. To read more about my love to send snail mail, check out the post “You’ve Got Mail” by clicking here. That’s a breathtakingly beautiful necklace! Wow! I agree! I was stunned when I opened the box! I know right?! I wasn’t expecting it at all! That is so touching and kind. You deserve to be on the receiving end of such a lovely gesture. Awe thank you but I don’t feel deserving but I am ever so grateful! I wore it on Friday and it was just perfect! What a beautiful necklace, and such a thoughtful gift! I love receiving unexpected gifts….they’re way better than the kind you get for your birthday or Christmas! I agree! It is such a sweet and extremely thoughtful gift!! I am still in awe! How sweet! That’s such a pretty necklace! It sure is!! I love it! Wow, what an amazingly thoughtful gift!!! What a beautiful gift and blessing. Thanks….I have almost 100 women already that I mail cards too but I would love to add to that list. It brings me joy to try and put a smile on the face of someone else. It’s beautiful!! What a sweet and thoughtful gift!!! Aww! So sweet! Hope you find whoever sent it! Thank you Evangeline! I just love this necklace!! What a thoughtful gift, I love it!!! ICLW – what a lovely surprise! Someone is a vertical thoughtful gift-giver. Um, that should be “very” not vertical. Thanks autocorrect! So sweet!!! Someone who has your address,. but who could it be??????????? I know right?! 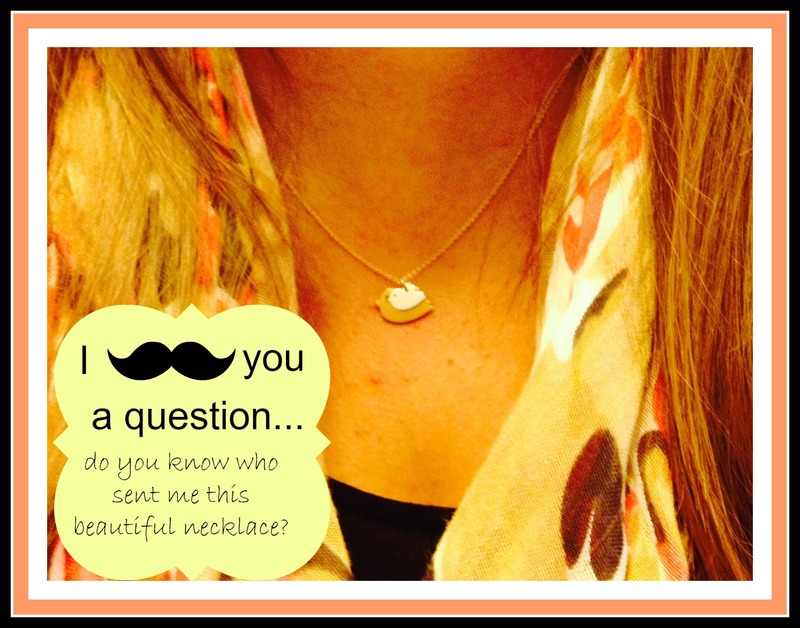 I have over a hundred addresses from women that I already send encouragement cards too so at least a hundred women have my address…needless to say, I can’t seem to figure it out But I just stinkin’ love this necklace! That was soo thoughtful of your secret friend! I love it! Did you find out who it was? ❤ I also love how encouraging you are to so many of us here. Truly, you inspire me! What beautiful and thoughtful gift! Wow, so nice of someone to surprise you with this….I hope you find out who it was so you can thank them, but I think the surprise is a nice part of it too! Its apri–I have also been following you. I got you for the card swap as well. Its been quite fun getting to know you through your blog. You are so much better at posting often than me! lol. I hope to catch up on mine this weekend. I am so glad that I was able to find you through the card swab and find your blog. It has been wonderful! It’s beautiful! I’m so glad you have mystery giver. You deserve it. I just received the bibs for baby sunshine in the mail today. Thank you so much, my sweet friend. They are darling and totally made my day. You are a fabulous snail mail sender. We are all blessed to know you!